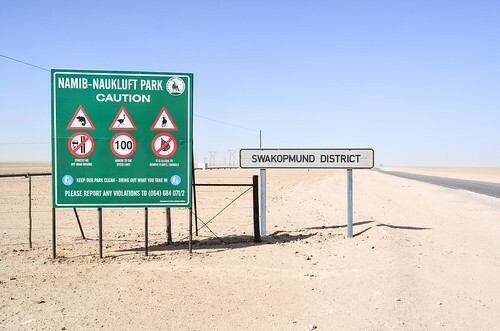 The desert between Swakopmund and Windhoek, part of it in the Namib-Naukluft national park, is hiding lots of uranium. 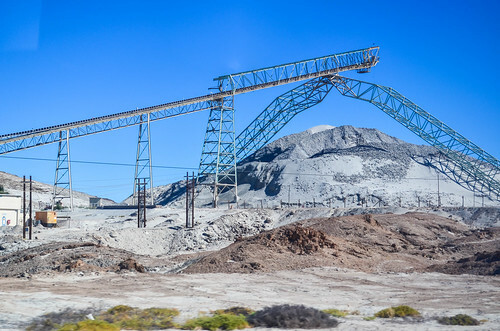 To continue with the mining in Namibia, having already visited two and a half abandoned mines (in Tsumeb, Uis and Brandberg West), I register for the tour of the Rössing uranium mine in Arandis, along the busy B2 road to the capital. I am not cycling there as it’s not open to the public, and especially because I want to take the C28 road instead. 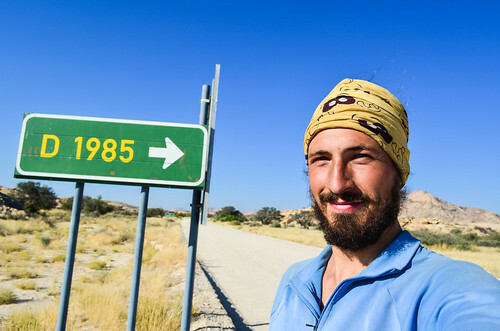 This half-day bus tour is perfect for my legs that have just returned from a painful ride on the Skeleton coast. 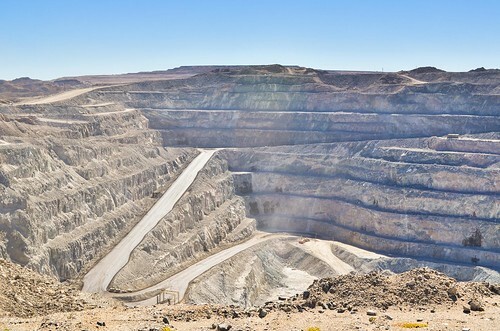 The Rössing mine belongs to the British-Australian giant Rio Tinto, and is the longest running open-pit uranium mine in the world. It is today among the largest uranium mines in the world. Namibia is the fourth largest producer of uranium worldwide (8%), behind Kazakhstan (36%), Canada (15%) and Australia (12%), and all its uranium comes from the same region, in the Namib desert, 50-100 km east of Swakopmund. Some of it ends up in the French nuclear power plants. The tour starts with a brainwashing corporate video about Rio Tinto, taking place in a classroom among dilapidated buildings. 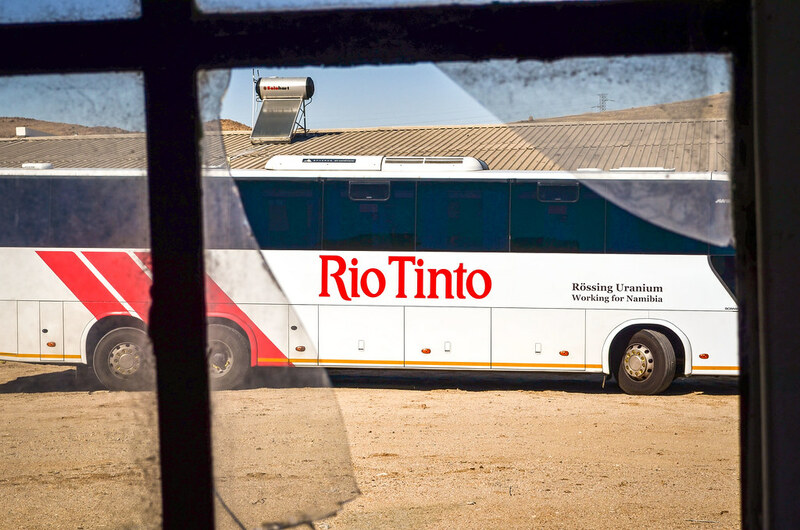 It’s rather strange and unprofessional for a tour conducted by the company itself, as strange as the bus driver losing his way in Swakopmund, and later forgetting his keys in the bus, making the visitors wait outside the mine gate for an hour. We learn that one barrel of uranium powder (yellowcake) is worth the energy of 40’000 oil barrels. Then, we all pass the breathalyzer test and drive until the viewpoint of the open-pit. 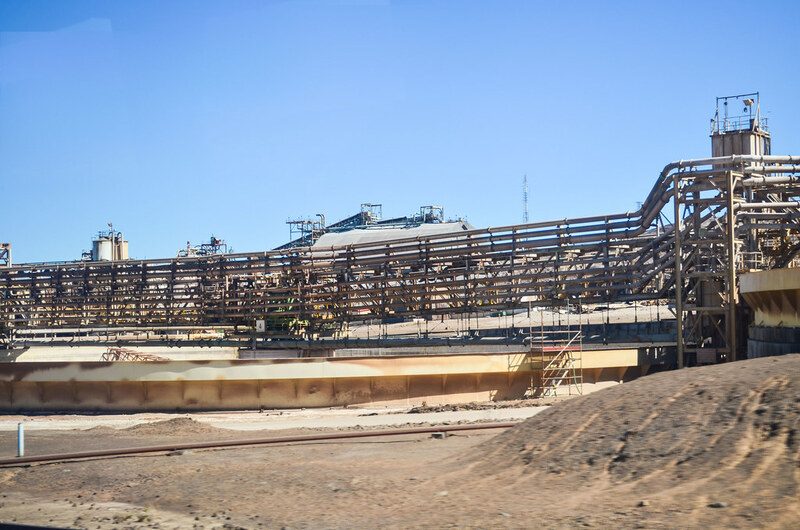 Operating since 1976, the open pit is 400 m deep and 3 km x 1.5 km wide. It makes a beautiful hole into the Earth, easily visible from the sky (Rössing satellite picture). 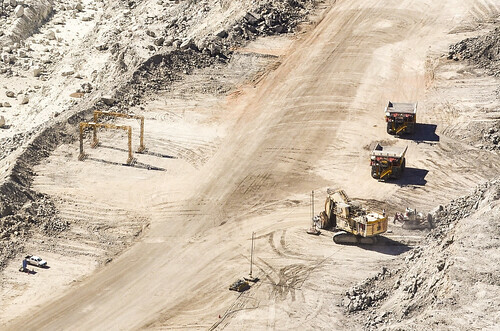 We are all surprised at the very little activity there: no more than five haul trucks are operating in the open pit. 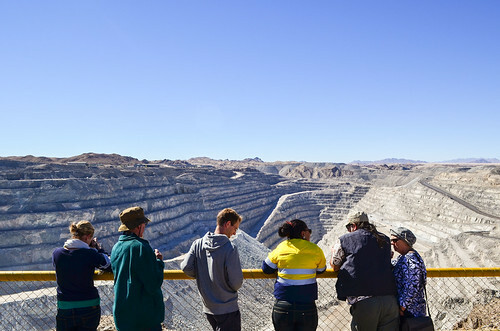 The tour guide confesses that with the prices of uranium falling, they have to reduce the activity at the mine. 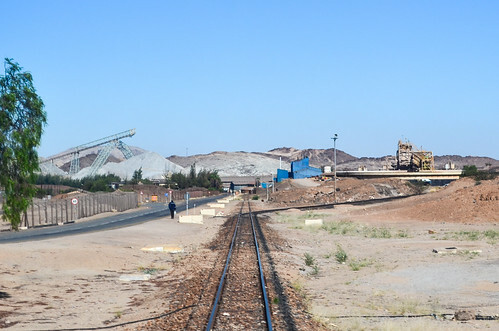 On the top of layoffs, a neighboring mine (Husab), with ore of better grade, owned by the Chinese, is recruiting the Rössing employees. They are doing well because they don’t have to sell the uranium: it all goes to China. 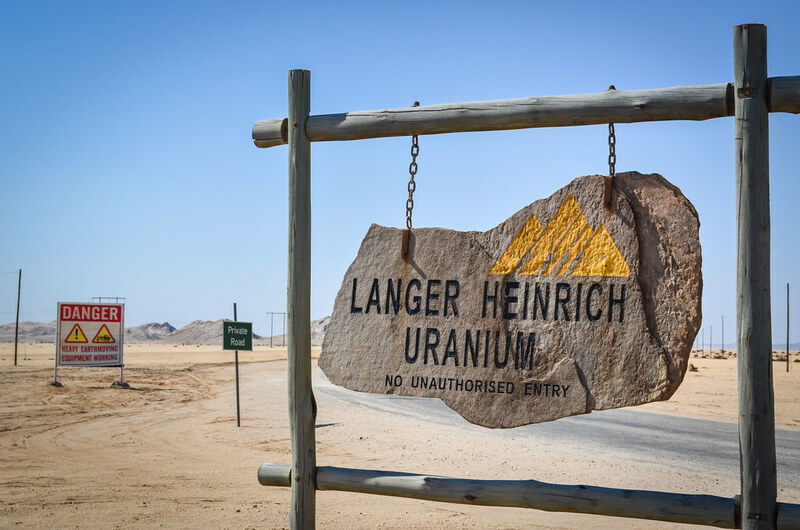 Uranium was discovered in the Namib Desert in 1928 but explorations began only at the end of the 1950. 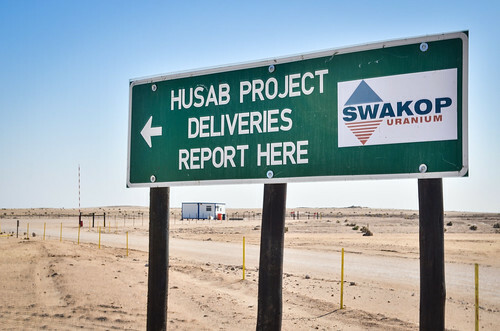 Rössing is the largest of three mines exploiting Uranium in the Namib, the others are Langer Heinrich operated by the Australian Paladin Energy (70 km away, Langer Heinrich satellite picture), and Husab (10 km away, under construction, Husab satellite picture), under Chinese ownership via Swakop Uranium. But there are also more recent projects in the same region, such as the Valencia and Namibplass deposits of the Nosara project (Valencia satellite picture) by the Canadian Forsys metals, the exploration of the Goanikontes/Etango deposit by the Australian Bannerman, and further north the Trekkopje mine (Trekkopje satellite picture) of the French Areva, next to the Australian Marenica project. 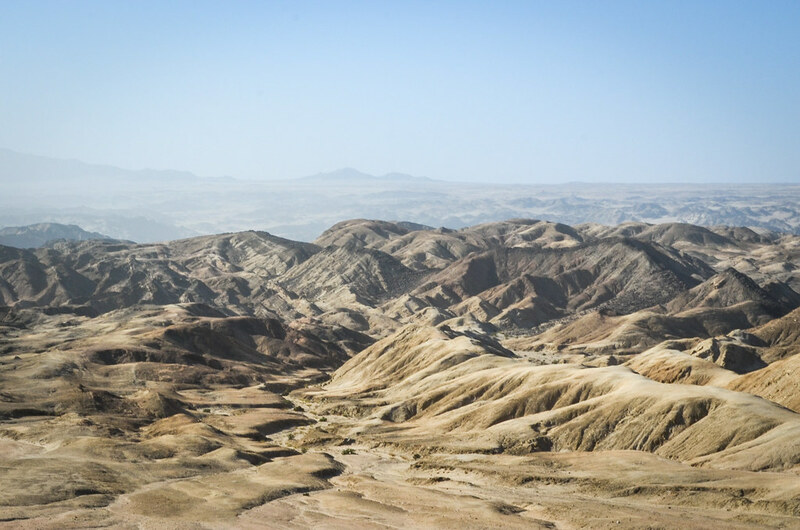 Not only a tourist destination and a national park, this region is also a real uranium reservoir, each project more or less claiming to be the largest unexploited deposit in the world. At its center lies an old closed mine, the Khan mine (Khan satellite picture) in the Khan ephemeral river, just 5 km from Rössing. 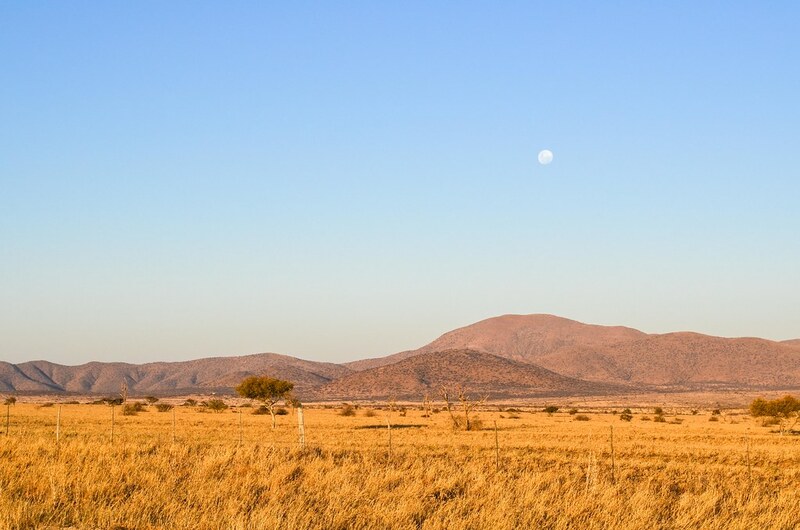 Without doing it on purpose, I will, on my way to Windhoek, pass next to the Goanikontes project near the Moon Landscape, the Langer Heinrich mine, and various other projects. The haul trucks are diesel-electric. 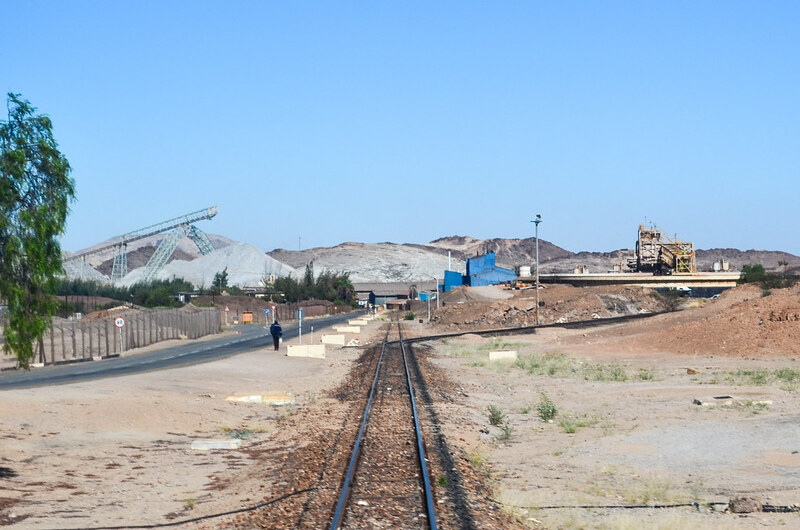 They can drive up the pit with cables, like a tramway, but need anyway 2000 L of diesel every second day. 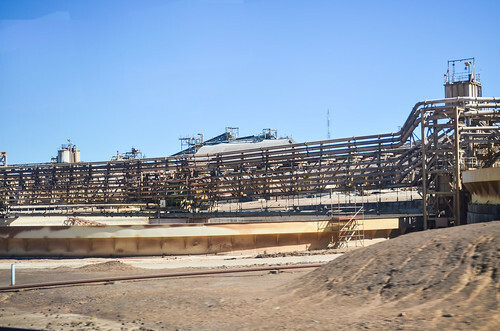 Once out of the mine, they are screened to check the radiation level of the extracted rocks. If it’s too low, the truck drops them in waste dumps, because it means the ore is not rich enough and not profitable to be taken to the crusher for processing. 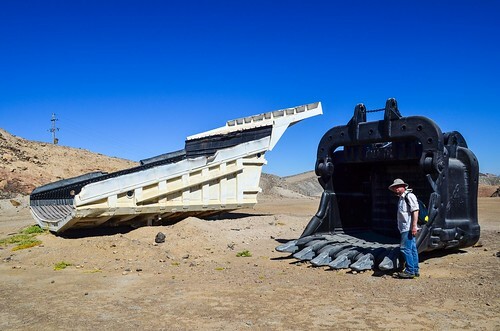 That’s it for the mining tour. And it’s only uranium. 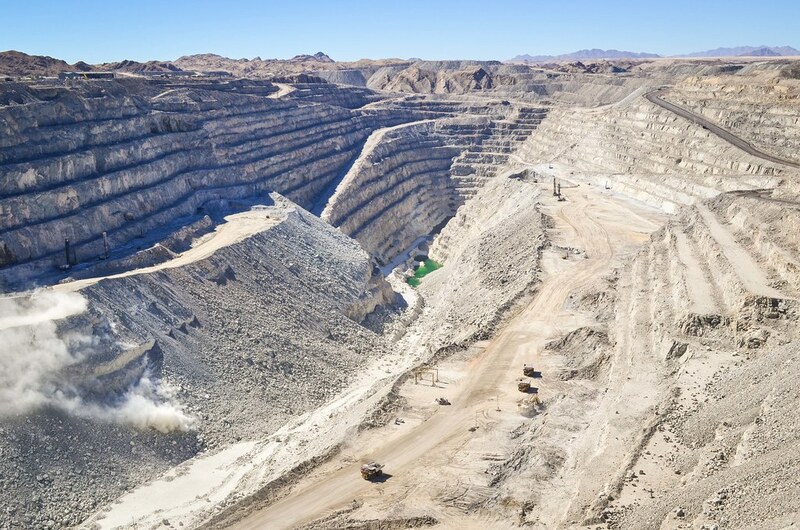 Namibia is also in the world’s top 10 diamond producers (1.3% of the world’s diamond supply). 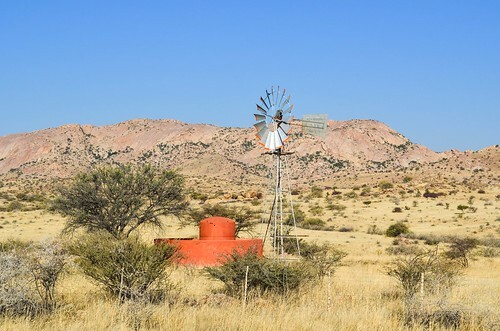 The country is so large and bare that it’s easy to miss on the mines, which are well hidden away from the public roads. 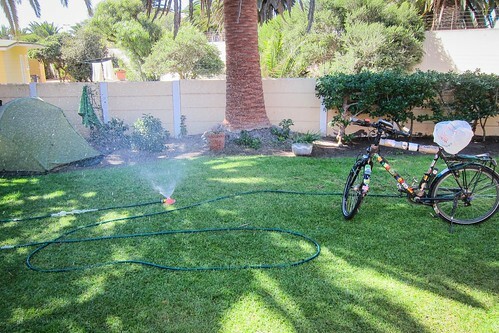 Back in Swakopmund, rested and before continuing my journey on two wheels, I first need a good bike cleaning and oiling. The Namibians, experienced with their bakkie maintenance, told me that if I don’t do it as soon as I leave the salt road, it will rust and fall apart before I reach South Africa. The wind is now coming from the north. Is it doing it on purpose? 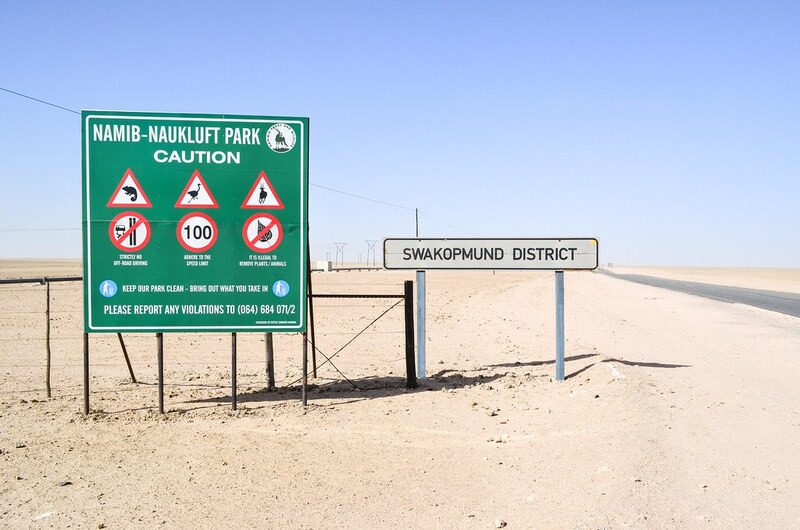 I had it against me when coming down to Swakopmund, and now it switched sides, and is still not helping me. I am engaging onto the C28, the shortest route to Windhoek (325 km) but far from being the fastest. 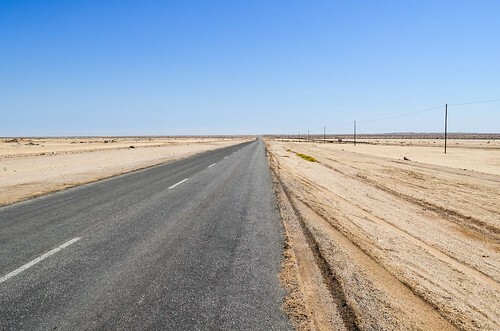 The B2 highway, slightly longer (365 km) is tarred all the way and is the main one. On the other hand, the C28 is mostly gravel, rather deserted, and has a mountain pass so steep that no heavy weight vehicle can use this road. With almost no traffic and scenic views, this is the road a cyclist (with good tires) will take; not the B2. It was hard and slow to get into Swakopmund, my long awaited break, but it takes a minute to leave the city boundaries and get lost in the desert again. Just before leaving the town for the C28, there is a tiny museum dedicated to Martin Luther. It is closed as it’s a national holiday today. 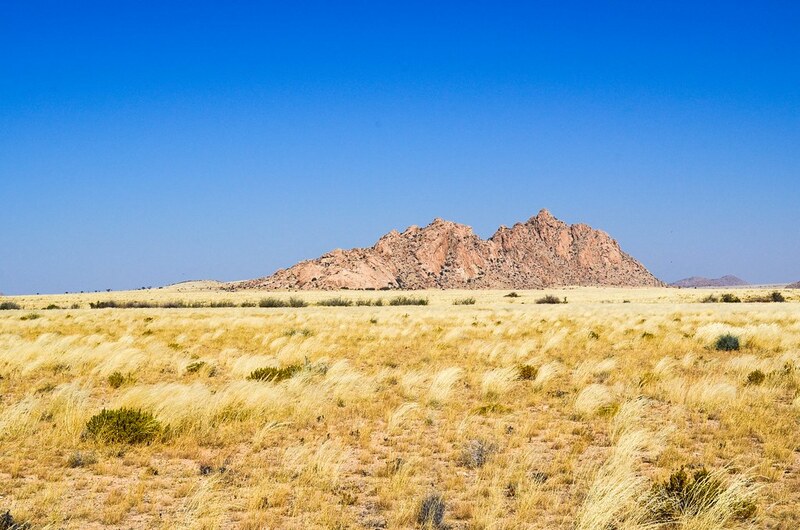 Namibia is so quiet and underpopulated that it can be confusing if asked to make a difference between a working day, a Saturday and a national holiday. But I can still see Martin Luther through the window. Its history is interesting and representative of the German colonization. It was brought from Germany into South-West Africa in 1896 by the Schutztruppe (the German colonial army) to replace the carts and wagons relying on oxen, because they couldn’t survive long journeys in the desert. 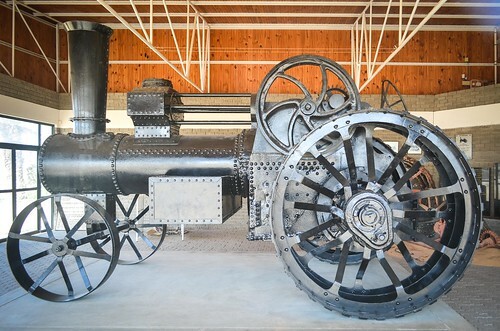 But the 14-ton steam engine was bad at dealing with the sand tracks. 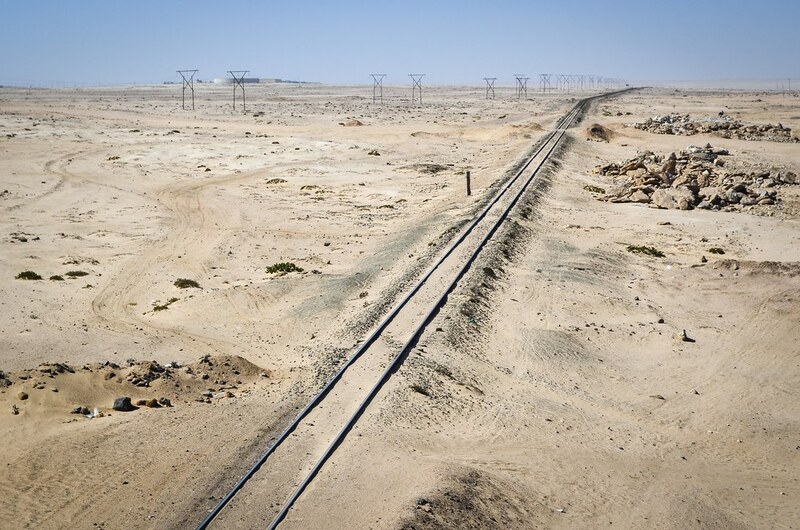 After transporting a few loads, it got grounded in 1897 only four kilometers out of Swakopmund. 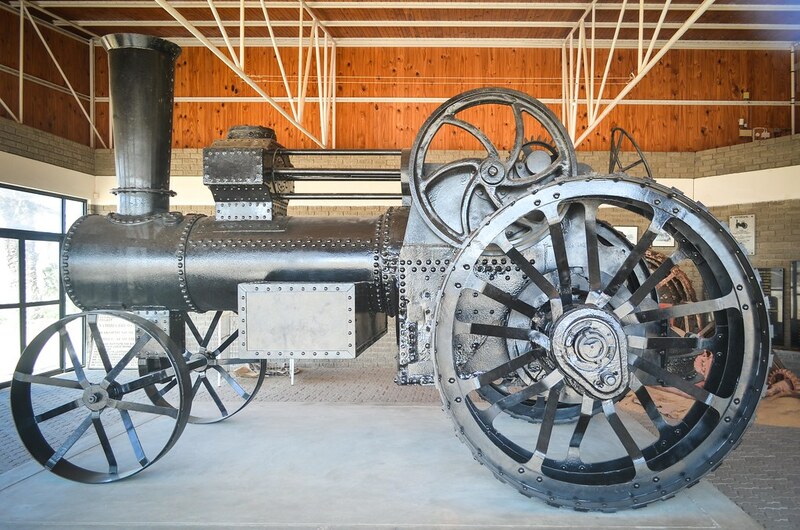 A local resident is said to have said the following words: “Did you know that the steam ox is called ‘Martin Luther’ now because it can also say — ‘Here I stand, I can do no other’ ”. Thus the engine gained its present name, although recent scholars have doubts as to whether Luther ever did utter these words. And as soon as I take the turn to the C28, the traffic disappears. 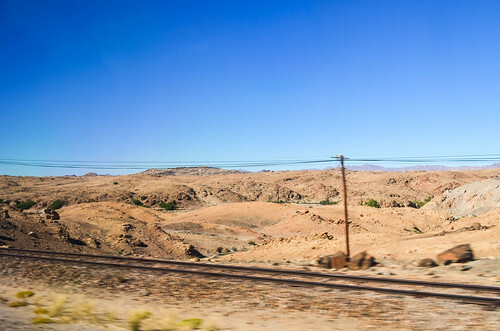 This is the desert, and it’s about to fill half of my distance to Windhoek. The road is asphalted for the beginning. 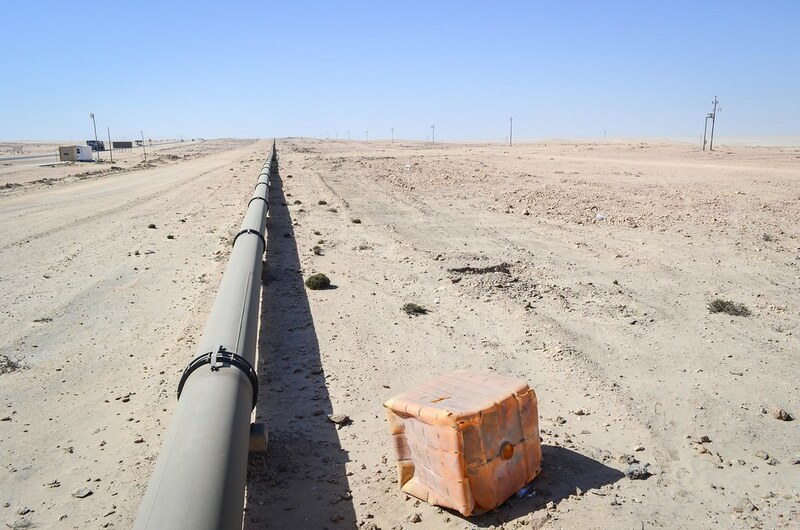 I seem to follow a pipeline for one of the numerous uranium mines of the region. 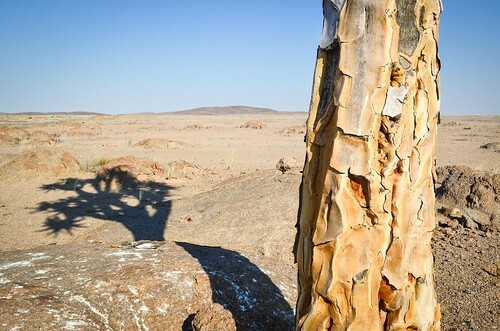 The Namib-Naukluft national park, encompassing part of the Namib desert, maybe the oldest in the world, starts now. It means there will be nothing, no farms, and no help for more than 100 km. But it doesn’t prevent mining companies to secure uranium-rich plots. 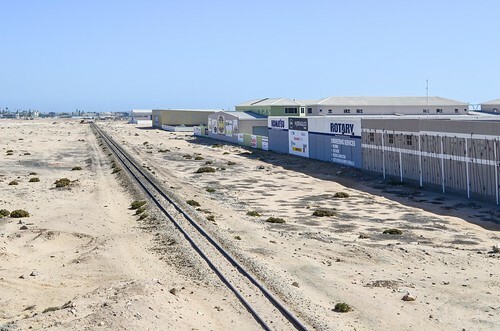 One can use the three main roads between the coast and Windhoek, but for the smaller ones, because of the restricted status, a permit is required. Bad news, as I just want to make a small detour to the Moon Landscape, not too far from the main road. I venture there anyway. I’ve seen so few cars. Maybe on a national holiday, the patrol won’t be catching me. 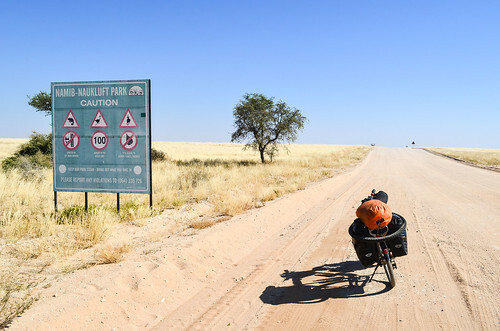 I reach my 24000th kilometer while cycling around the Moon Landscape, which designates the rugged hills around the Swakop river canyon. It’s a very nice scenery, but the wind is very strong. It’s coming from the north and hits me on the side. I wish I can reach the first hills quickly so that I’m freed from the terrible coastal wind. The Moon Landscape is fantastic. There is a lodge and campsite inside there, Goanikontes, but having still enough water, I skip the extra detour. I have these terrific dry peaks on my left, while my right hand side is flat and deserted … apart from a few signs from Bannerman resources, now and then, prohibiting access. The Australian exploration company could destroy it if they are allowed to drill and dig everywhere. The road continues further to the oldest welwitschia plants (> 2000 years old), but having seen enough around Brandberg West, I will just return to the C28. 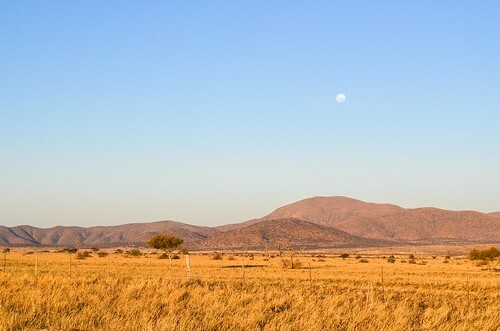 First, I need to sleep, and the hills of the Moon Landscape will provide a shelter against the wind. 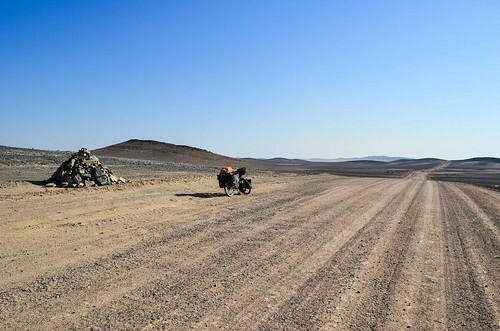 Near a junction of gravel roads where piping is behind buried underground, I find a dry river bed suitable for my tent. However, during my regular inspection of the surroundings to find the best spot, I notice a lot of small white droppings. Instantly, I make the connection with what I have learnt during the past days: 1) hyenas and jackals often visit the coast during night time for scavenging, and 2) “hyenas make white poop as they eat anything, including bones“. 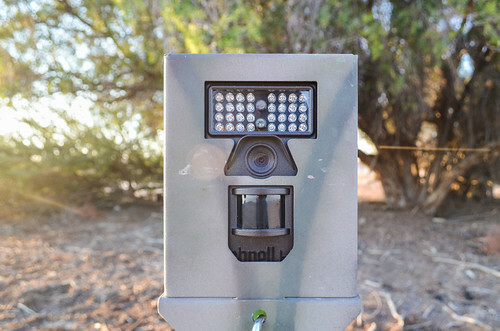 I’ve never been really worrying about wild animals while camping in the middle of nowhere, but now I am. Hyenas are like big dogs eating everything. With that many white poops around the place, they are surely here. It’s now night and I can’t go anywhere else. I have heard that they have an easily distinguishable eerie laugh. I don’t know what it sounds like (actually, like this), but I listen carefully to the sounds of the desert. I think the little singing comes from birds I can’t see. So I set up my tent, and thanks to the one bar of signal I still catch, I google about hyenas to learn how to deal with them. 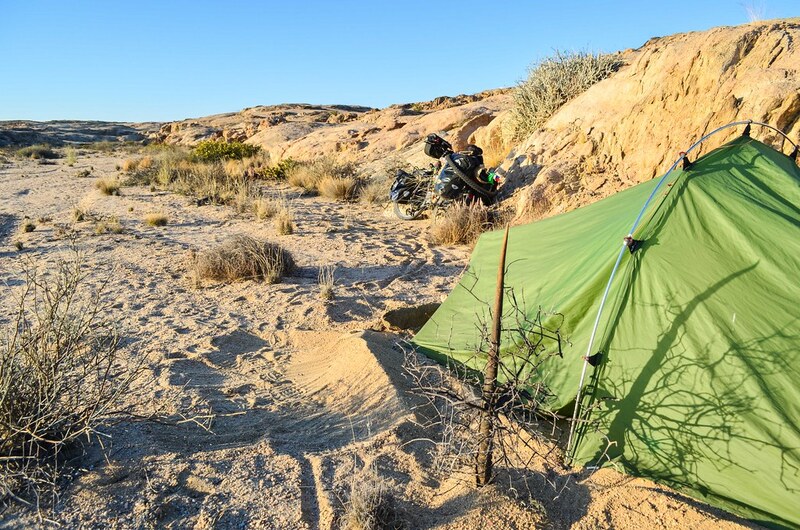 One page says that you shouldn’t get out of your tent during the night. 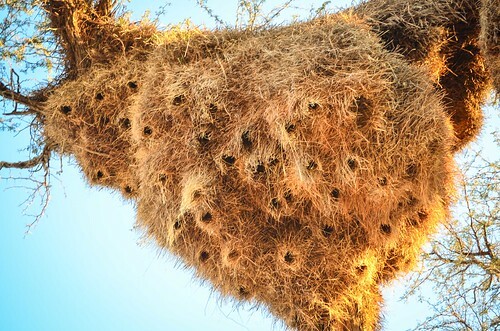 Animals (including hyenas) will not try to look what’s inside. It adds that hyenas will be scared if you are taller than them (so the Gods must be crazy‘s scene is true! ), but if you sleep under the open sky, laid down, they will bite you. It recommends to put everything inside in the tent: shoes, pots, food, as the hyenas will eat anything. 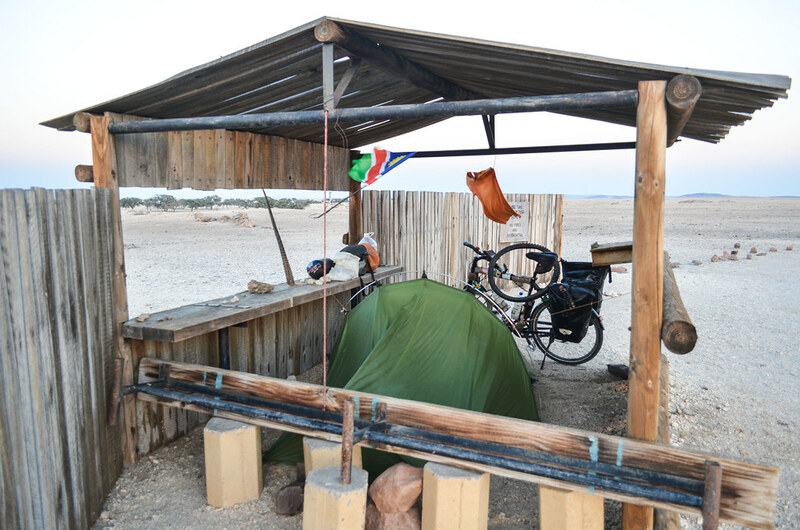 The second webpage I open is a mother ranting against a campsite in Botswana (apparently the worst country for people scared of wild animals), because her 11 year old son was attacked by hyenas in his tent, dragged away and killed. Hmmm … not good to read just before sleeping. On the top of my small hill, I’m surprised to see a row of lights afar. I thought I was alone in a good 10 km radius. 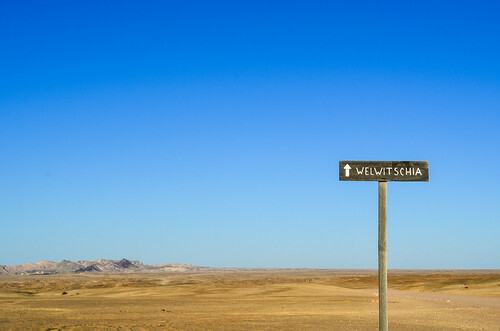 After checking on my maps what it could be, I come to the conclusion that it could only be the Rössing mine, 30 km away. 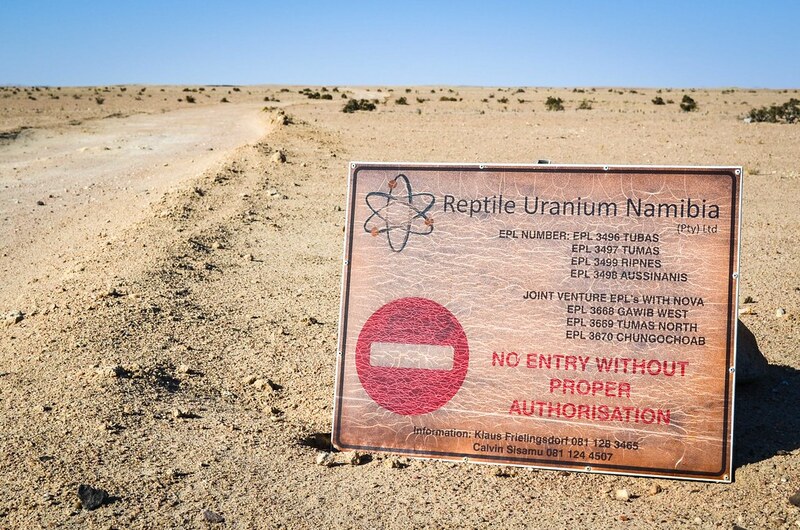 Or another uranium mine in between. Well, I put all my things inside the tent, and get suspicious at every single noise. I wish I didn’t know about hyenas, I wouldn’t be this scared. I imagine myself going out under the moonlight and fighting a pack of hyenas with my oryx horn if I hear them sniffing my bicycle. But fortunately, a cycling day is enough effort to make me tired and I fall asleep quickly. 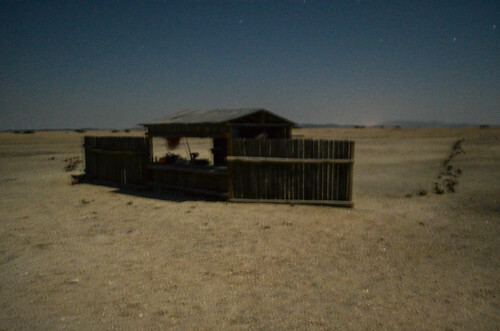 Luckily, no hyena came to visit me during the night. Or they did it quietly. The wind also stopped and I couldn’t sleep any better. Time for me to pack quickly and return on the C28. 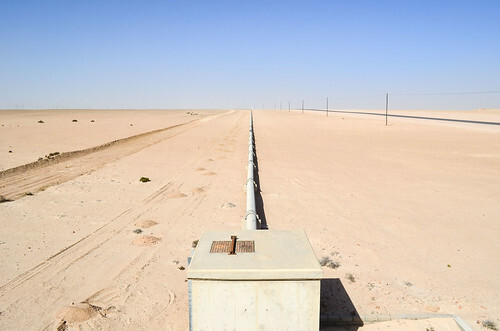 Workers are working on an underground pipeline, it could be for the Chinese Husab project. And these first 10 kilometers without wind are so nice! 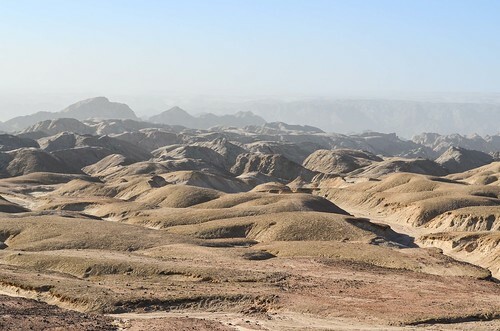 In addition, nobody asked me for a permit on that short getaway to the Moon Landscape. But just as I am thinking that I will finally have a windless day, it rises and now comes from the north east. Right in my face. Not again! I feel cursed and hate Swakopmund even more now. When I feel powerless for too long, I just walk along with my bike. This kind of desert roads are perfect to realize how slow I am; when I turn back I see clearly where I did my last break some time ago. And it’s very close. 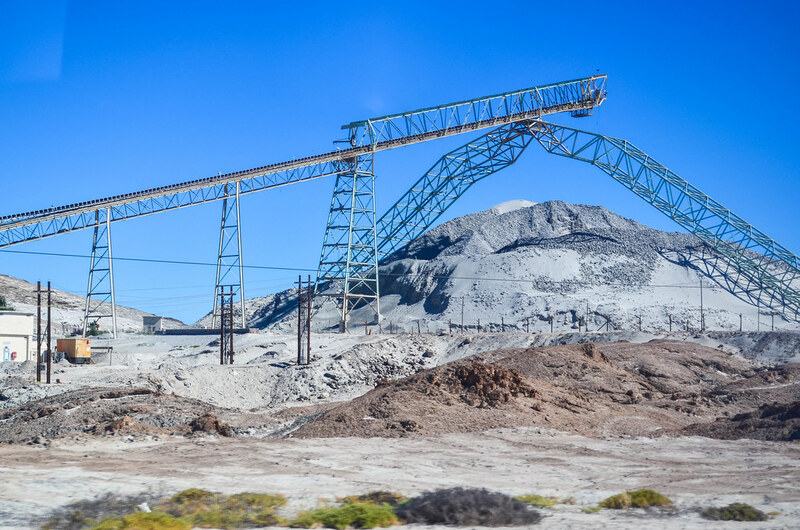 The tar ends at the junction with the Langer Heinrich mine. 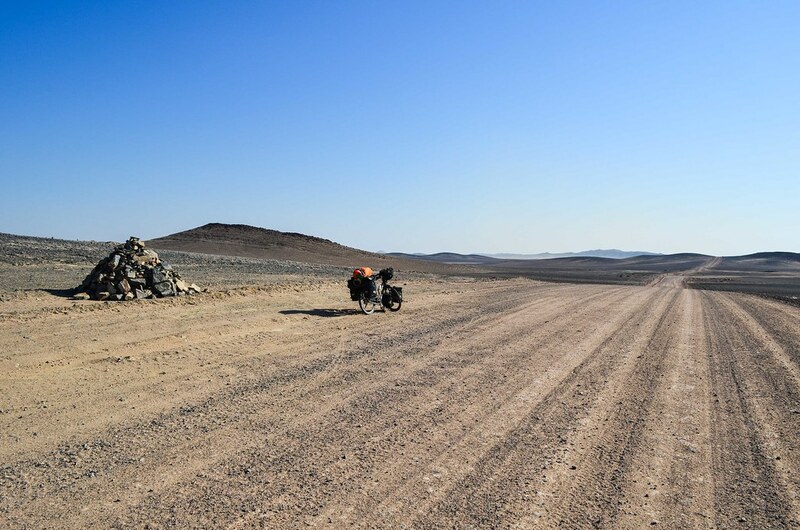 The road is continuing straight on a good gravel surface, and the wind doesn’t weaken. My GPS is disturbed and doesn’t get a proper fix, I noticed it happened before when the weather was very windy, under a clear sky in a flat place. It makes no sense to me that the wind impacts the GPS signal in the desert, but it’s real. The wind weakens only in the late afternoon, after having made me quite angry for most of the day. I can now cycle a little bit faster. Going over 10 km/h is not something to be proud of, but it’s more of a relief. 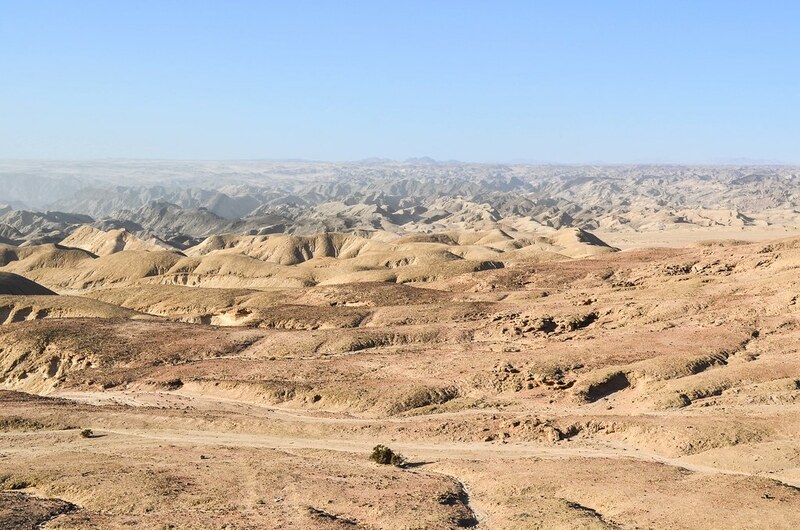 The longer I stay in the Namib-Naukluft NP, the more worrying my water reserves become. Talking about water, I am down from 10 L to 2 L left in 36 hours. 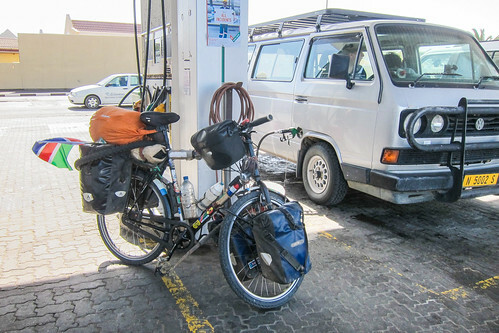 Stopping cars and asking for water is the only way for cyclists to survive, apart from carrying 25 L, which wouldn’t be good for the spokes. That’s why I stop one of the rare cars at 4:30, most likely my last chance to get water. 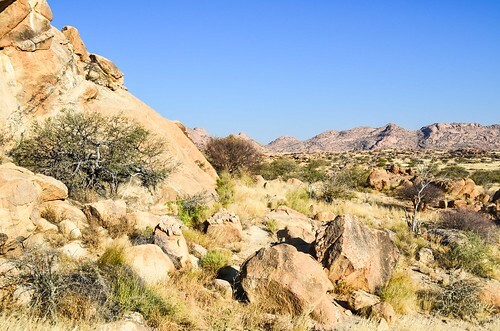 The drivers are Namibians and they know how to deal with their nature. I ask then how to react to hyenas. They have seen one on the road just five minutes ago! Not a dangerous one, but a striped one. Apparently there are several species. The brown and spotted ones are dangerous, but the striped one is not. They confirm that they’ll eat me if I am laying down outside, they’ll bite everything that I leave outside of the tent, but they won’t attack me if I am standing up or hide in my tent. “When we used to go camping in the wild, we would build a kind of scarecrow with our shirts and wood sticks. 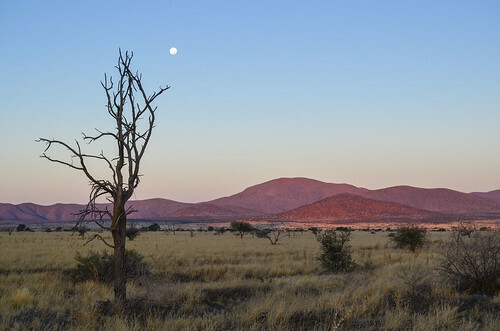 With the wind slightly blowing in it, it can deter hyenas from getting close to your tent.” Okay, good to know, as I’ll have to camp another night in the national park. Besides the hyenas, I am still worrying about my tires. I replaced them in Tsumeb, less than 1500 km ago. 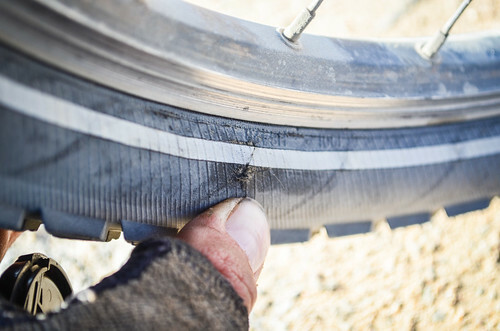 I got the same ones that lasted twice over 10’000 KM with less than 10 punctures in 18 months, and I didn’t expect this set to show signs of wear and cracks so early. From the very beginning, they had black stripes like if they were under inflated. Now, the sidewalls are already opening. I can’t believe they are so poor. There is actually a small difference with my previous ones: due to stock availability, I got the wired version instead of the folding version. 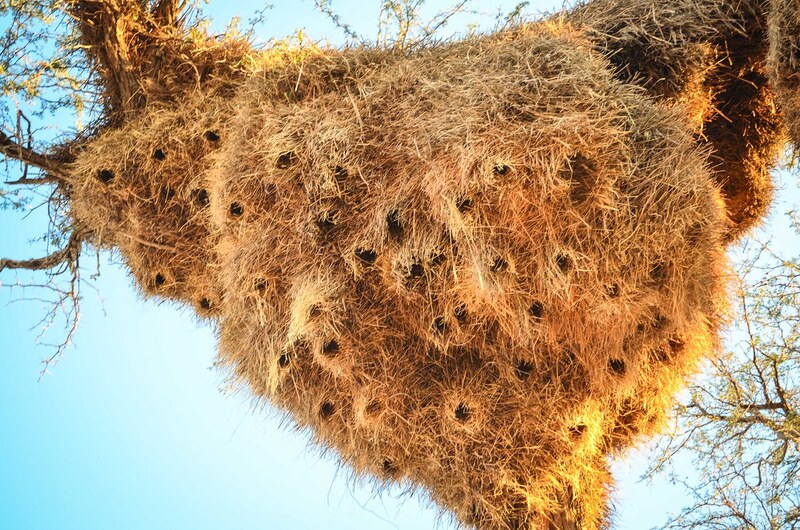 I don’t spot any hyenas in the wild, but many ostriches. They are funny because I first mistook them for cars: they are like black dots moving straight in the savanna, the legs and head almost invisible. I finally enjoy the day at sunset. 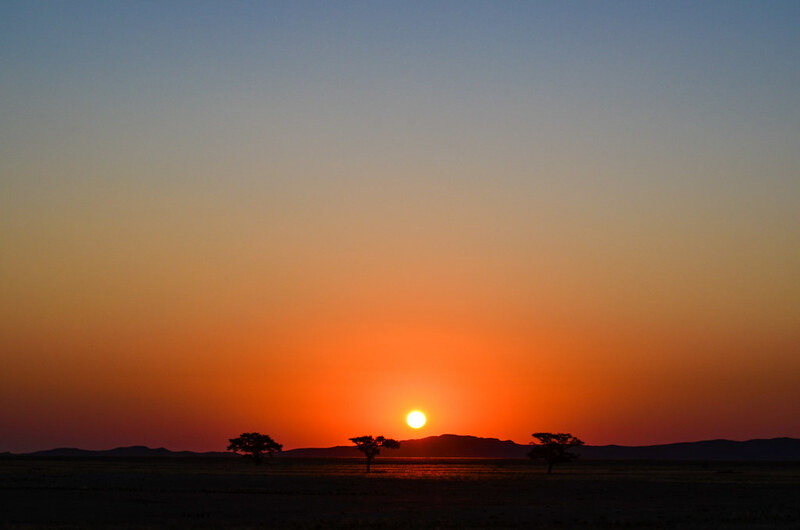 The dim light during the sunset minutes makes the savanna so beautiful. But less wind means the annoying flies are back! I’m never at peace here. There are also bigger stinging flat flies, very sticky and they won’t go away even if I hit them on my skin. 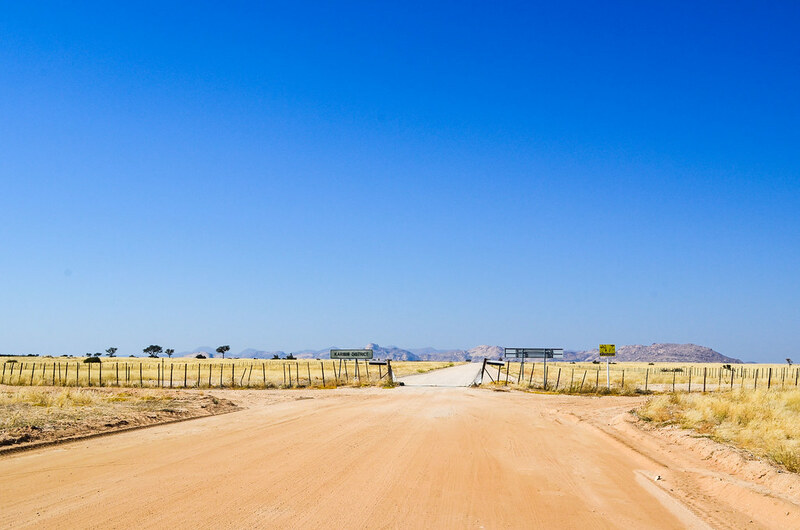 I noticed on Google Maps a label 5 km off the road:”Hotsas waterhole” and “game hide”. 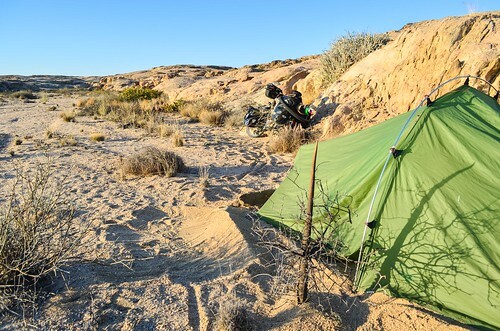 This location is also marked as a campsite on a paper map. Five kilometers is just the distance I can afford to cycle until it’s night. 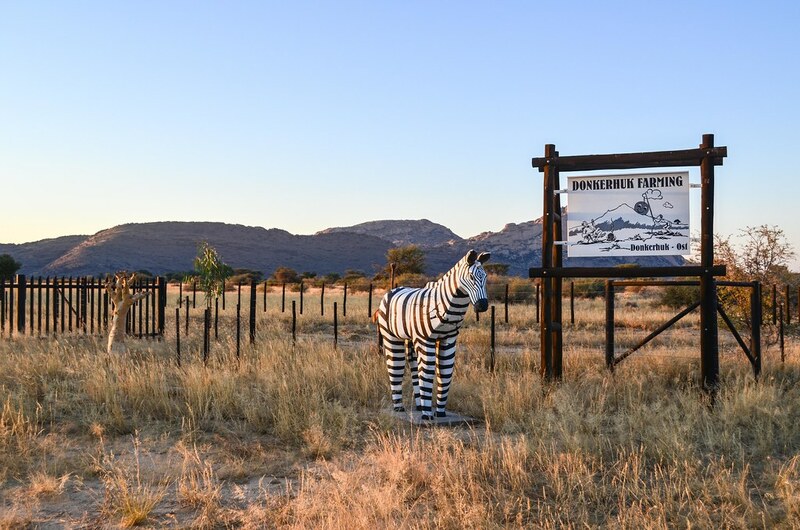 Going to a waterhole means I’ll be sleeping right where the animals gather, but if this “game hide” and campsite actually designates a safe place to sleep, it will be better than pitching my tent in the open bare land. Isn’t it a good place for cycling? 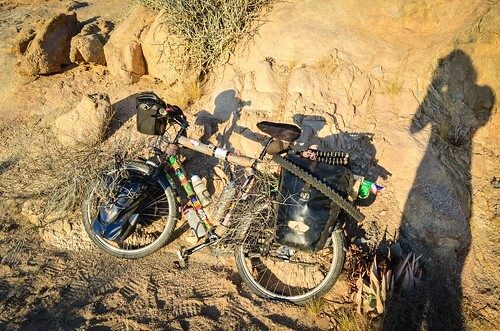 I am cycling fast to the waterhole, wondering what kind of “game hide” or campsite I will find. I really hope there is something “safe”. Ostriches are running parallel to me, we both go to the same place. 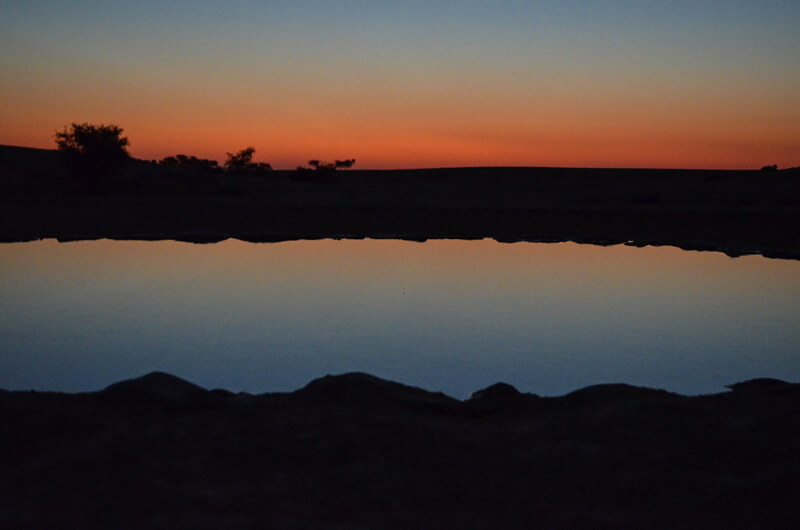 I reach Hotsas just after sunset. There is a windmill pumping water into a large 5000 L plastic tank, and then into a shallow pool. A bok is drinking in it but disappears before I get close enough to identify it. This is in now way a campsite. Unless my map calls “campsite” a secluded place where these Toyota Hilux and Land Rovers fully equipped for camping on the rooftop can park. The “game hide” is a wooden shelter with a window, a hundred meters from the waterhole, to observe the wild visitors. It reads “no overnighting“. It’s not as “closed” as I hoped, with only two walls, so I build my anti-hyena defense system around it. I block the two open ends with the bench and stones on one side, and with my bicycle on the other side. 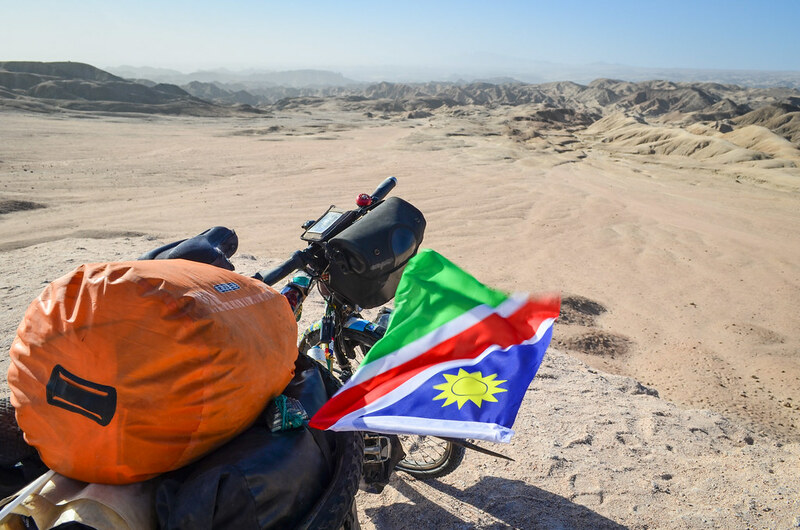 I find two pieces of iron wire, which I hook under the roof and let my shirt and my Namibian flag hang on. That makes two scarecrows. If I feel too much in danger, I could run to the plastic water tank: it has been put inside a much bigger and older storage pool with high concrete walls. I expect many animals to come in the next hours, but I’m too tired to watch anyway. The strong wind is not stopping, even at night, and not broken by the walls. It gets right into the shelter and I have to move my tent to set it closer to a wall. The annoying wind blew all night long, imposing me a noisy sleep. Vultures are at the waterhole when I wake up. I don’t know how many animals went there to drink while I was sleeping, but the three cameras with motion detection probably know more. I won’t be taking any picture for the whole morning today. When I have no pictures for a long period, it’s either because there is nothing interesting or beautiful to record, or because I’m not in a mood for taking pictures. 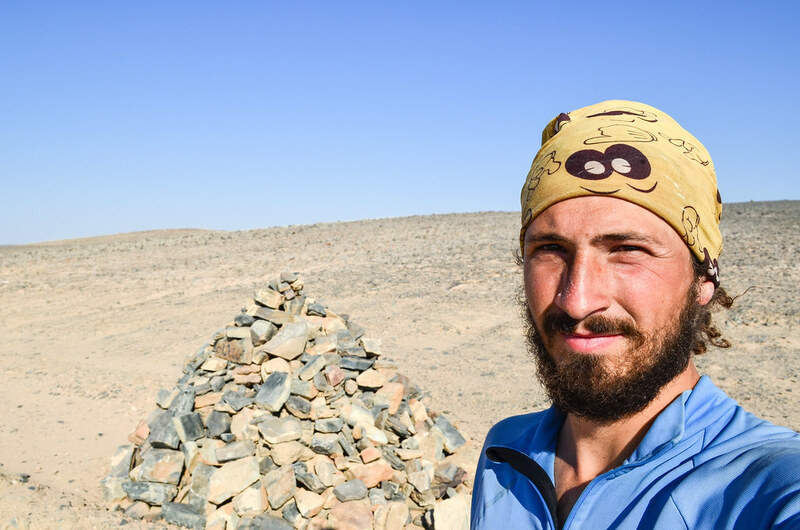 The later explanation is the right one here: the constant battling against the wind and the feeling of despair of not being able to make any significant progress are responsible. The twenty last kilometers in the Namib-Naukluft national park are in a straight line, with ostriches and game running in the bare savanna around me. It’s very beautiful, and completely spoilt by the wind. A look at my GPS and I realize I am already at 1100 m high. I didn’t notice any slope! 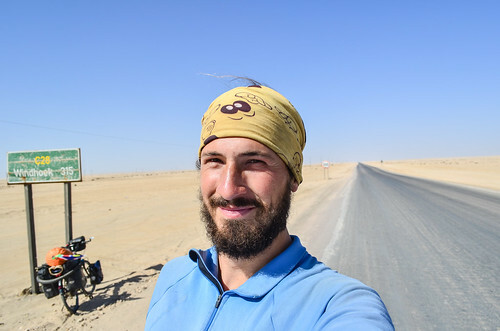 The 100+ km through the desert looked flat, but I was actually steadily going uphill at 1%. With the wind, I was not able to notice it anyway. 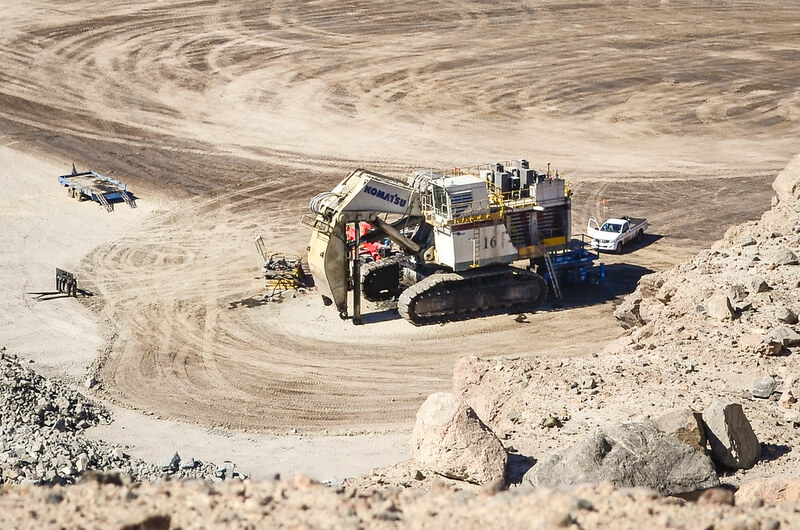 Finally, it’s good news: it means the Boshua pass won’t be as long as I thought! Being out of the national park signifies that I’m back into the White farmland area. 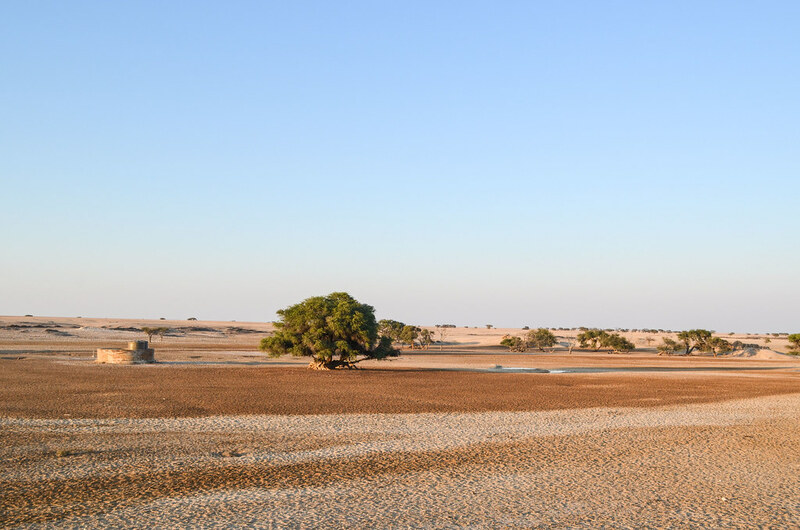 The small difference with the desert is that every piece of land is fenced and there is a farmhouse every 10 or 20 km. But not as friendly as it could be, as the farmhouses are deep inside the private land, sometimes after 10 km of dead-end dirt road. 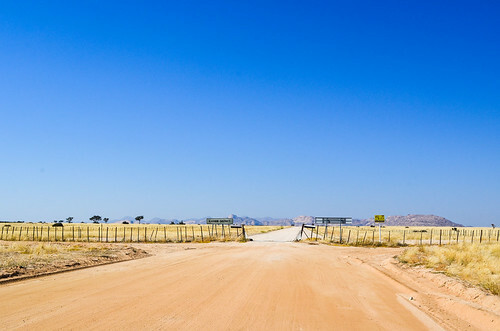 The first path to a farmhouse appears after 10 km along a fence. I need water, and the safest is to follow that sign until I see a human, the first of my day, at 2 pm. I venture on the private dirt road without knowing how far will the farmhouse be. Luckily it’s only 4 km away. I refill 10 L and feel much better! Now that I’m away from the desert winds, being almost back into the highlands, a new worry surfaces: I didn’t consider so much food. I have always carried enough spaghetti for four of five days maximum, and have always found a way to get food before I ate up all my reserves. But it seems I’ll soon get into trouble. 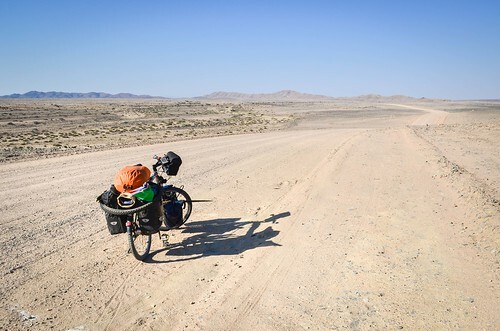 I estimated four days for the 350 km route from Swakopmund to Windhoek, and now, after three days, I’m not even halfway. The strong headwind is the main culprit, and my little detours add up to the delay. I’ll run out of food tomorrow! 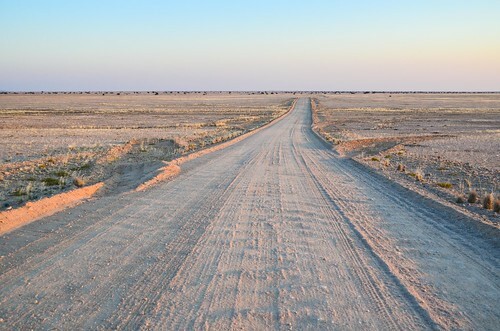 And have probably 3 days left on this empty road. Camping is not easy either. The farm fences are all over the landscape, even on rocky hills. 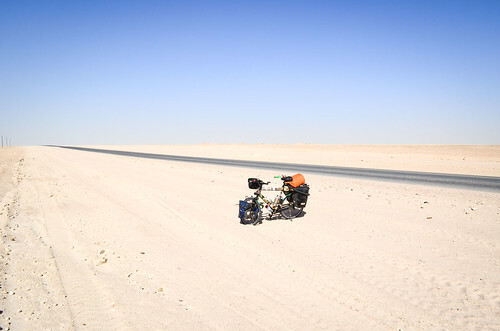 There are only two to three meters of grass on each side of the road to pitch my tent. The farmhouses are too far into their own lands, and since the gates are locked, and no one outside, I can’t even ask for the permission to enter and find a suitable camping spot. On the other hand, considering the quasi-nonexistent traffic, it’s not a big deal to sleep right by the gravel road.